This is going to be the vaguest review I’ve ever written. You do not want “The Cabin in the Woods” spoiled for you, and for this film, the definition of ‘spoiler’ is as broad as possible. It is an endlessly inventive, surprising, genre-bending masterwork, and the most unexpected curveball the filmmakers throw at you comes in the very first scene. If you can make it to the theatre a blank slate, I guarantee you will be completely unprepared for what Drew Goddard and Joss Whedon have in store for you; the experience is revelatory. I thankfully managed to make it to my screening without glimpsing a single frame of footage or hearing any plot synopsis (beyond the implications of the title), and as such, the whole movie felt like a deep, glorious breath of fresh cinematic air. I see a lot of films, and though I never question my love for the medium, sometimes even I need a reminder of just why it is I keep going to the movies. “The Cabin in the Woods” is exactly the kind of kick to the gut I thrive on, the kind that keeps me doing this job, week after week, year after year. So I’m not going to spoil this movie. The only thing you need to know is that there is indeed a cabin in the woods, and as anyone with even the most rudimentary awareness of genre standards could infer, a set of college students, all embracing a different stereotype, travel there. I will tell you nothing else, and you should learn nothing else. Watch no trailers. Don’t talk to anyone who has seen the film. Avoid all reviews unless they promise to be spoiler-free and you trust the source. Director Drew Goddard and co-star Amy Acker came to the screening I attended (Amy flashed a warm smile at me when I asked a question, which just about made me faint…oh, Dr. Saunders…) for a post-film Q&A (most of which I can’t discuss here for fear of spoilers), and Goddard described the film as his and Whedon’s “love-letter” to the horror genre. Indeed, their enthusiasm is palpable, just as integral to the creation of each scene as celluloid. They have a deep, insightful, and affectionate understanding of the genre; as director, you can practically feel Goddard squirming with excitement behind the camera as he flawlessly executes some of the sharpest horror direction in years. His knowledge allows him to subvert many of the expected tropes in the most delightfully unexpected ways; several scenes begin along familiar lines, forcing us to anticipate a certain resolution, when all of a sudden, Goddard zigs when we expect him to zag. It’s hugely invigorating, but those moments don’t hold a candle to the real surprises Goddard and Whedon have in store. 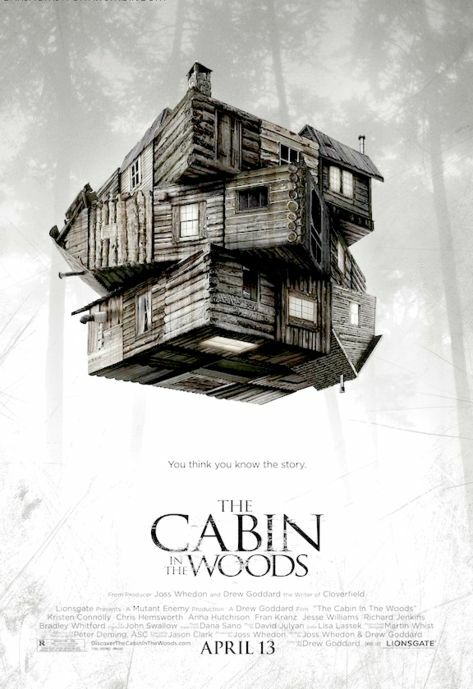 For as much as these filmmakers clearly love horror, “The Cabin in the Woods” is, at heart, a critical discussion of the genre. They use the simplest, most archetypical of horror set-ups as a springboard into a larger discussion of how a horror film is crafted, and more importantly, how and why audiences react the way they do. It reaches beyond what one sees on screen into the theatre itself, forcing the viewer to reevaluate how they view horror, and to start thinking about society’s role as well. The biggest twist, the one I mentioned above, is the insanely clever way Goddard and Whedon hold the audience accountable, firmly rooting the story in meaningful thematic subtext. But more than anything else, the film is just fun. Deliriously, uproariously fun, with bigger laughs than any comedy I’ve seen this year and genuine scares that will get your heart pounding. The numerous unexpected turns the film takes only make it more entertaining, because this is the exceedingly rare instance where you really don’t know what’s going to happen next. All you know is it’s going to be awesome. It’s hard to compare “Cabin in the Woods” to anything else, but if you’re familiar with Joss Whedon’s work, the easiest way to describe the film’s impact is to compare it to “Buffy” or “Firefly” or “Dr. Horrible.” We may take them all for granted at this point, but think back to when you first saw those shows; they all played with very old, worn-out tropes, but felt bold, original, and absolutely engrossing from moment one. Their entertainment value was unrivaled, but they were also wickedly smart, bursting with enough subtext and messages to write a thesis paper on. 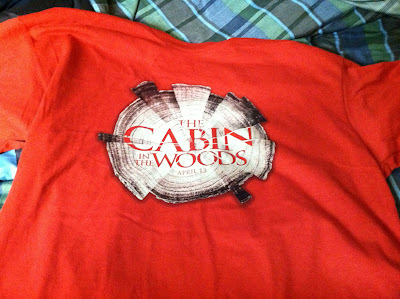 That’s “Cabin in the Woods.” If anything, it may be the most revelatory of the lot. And while Whedon’s hand is certainly omnipresent – good gracious is this dialogue to die for – it’s Goddard who took this thing over the finish line, and it’s his unique, wonderfully zany voice that makes the film click. His direction is simply fantastic, he gets tremendous work out of a top-notch cast (which I really can’t describe or even name if I’m to keep this spoiler-free), and I’ve seen very few films that play a crowd as effortlessly as this one. Before the film, Goddard instructed the sold-out audience to get into it and “be rowdy,” and we did. By God we did, and it was spectacular. If you can, see “Cabin in the Woods” with as many other people as possible, ideally at midnight, because the crowd reactions are weaved into the fabric of the experience. We’ve come to expect certain things out of the cinematic medium at this point. If you get to the theatre even half as often as I do, you start thinking that nothing could be truly surprising at this point. Even the best movies I see each year never feel entirely fresh or unexpected. There are only so many ways a film can go. It’s finite. That’s how it works. Despite having heard so much positive hype about “Cabin,” I had trouble believing it could truly break down such concrete barriers. But trust me when I say Goddard and Whedon find new directions. Over, and over, and over, and over again. “The Cabin in the Woods” is the best American film of 2012 so far, and even with a truly invigorating slate of movies schedules for the next nine months, I doubt many movies are going to come close to this one. 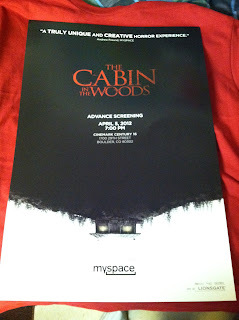 “The Cabin in the Woods” opens is now playing in theatres everywhere. Jonathan, thank you for your journalistic integrity. Like the movie you are reviewing, your review is a breath of fresh air. There are too many critics who have do not hesitate to spoil the film for others, so it is a welcomed experience to have some sensibility and consideration govern the words you share about this picture. The filmmakers went to great lengths to create a work that unfolds with layer after layer of enticing discovery, and the untainted viewing of the film is a truly a wonderful experience. The filmmakers, the studio who invested in the films release, and the marketers who worked carefully to make the materials promoting the film all greatly appreciate your not having a sweeping comment or giveaway that undermines countless hours of labor. Glad you enjoyed it and we can't wait to see it again ourselves. Thanks again.